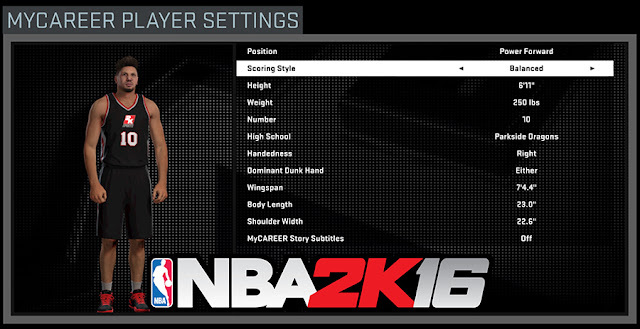 This guide is intended to help you create a MyCareer player in NBA 2K16 that best fits how you like to play. As most of you already know, there are attribute caps for every position and height this year. Generally, the taller your player is, the slower you run on the court. But there's more into that. Scoring style is another key factor that will determine your MyPlayer's attribute limits. There are three categories to choose from, and each is considered a specialization. An Outside player will have more emphasis on shooting 3pts and mid range, Inside is more on layup, dunk, hook shots and post fadeway, while Balanced is a mixed between the two. Select a player height, position and play style below to reveal the maximum caps. Weight does not matter when creating a player. It doesn't affect your speed, agility and such, so you can put any numbers you want. We will update this post once we gather more information regarding stats caps for other position, height and playing style. Note: NBA 2K16 sort of limits the way you can build up your character in the very same manner. You could be a pass-first PG, sharpshooter, two-way guard, swingman, all-around, stretch four, face up big, or a back-to-basket center. It's your choice how to spend your available upgrades.